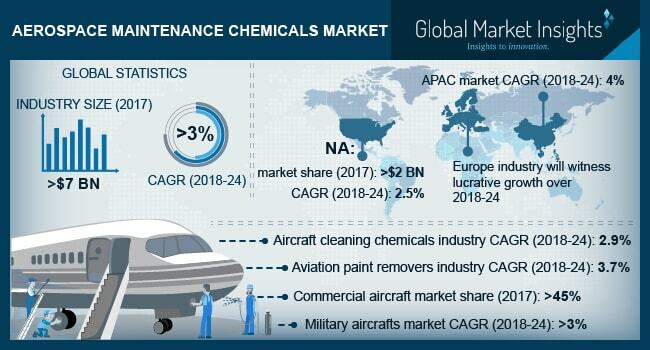 Aerospace Maintenance Chemicals Market size is estimated to surpass USD 8.8 billion by 2024; according to a new research report by Global Market Insights, Inc. Significant growth in global air traffic in conjunction with strict regulations pertaining to regular aircraft inspection is likely to drive industry growth during the forecast period. Rising MRO activities in developing economies owing to availability of low cost labor will further enhance aerospace maintenance chemicals market share over the forecast timeline. Improving living standards and decreasing air fare in emerging nations have boosted the travel and tourism industry. This has resulted into increased flight iterations, aircraft deliveries, and repair requirements. In addition, continuously increasing aircraft production to meet previous backlogs will fuel aerospace maintenance chemicals market size. However, factors such as product inventory management may restrict industry growth. Commercial aircrafts dominated the aerospace maintenance chemicals market size and accounted for over 35% of total revenue in 2017. This dominance can be credited to prevention of corrosion on exterior and interior surfaces. High overhaul requirements owing to strict regulations regarding passenger security across the globe has resulted in high revenue generation. Regulatory authorities across the globe, including European Aviation Safety Agency (EASA) and Federal Aviation Administration (FAA) are amending procedures and chemical requirements to reduce labor fatalities due to prolonged exposure. The industry players are undergoing product advancements to gain competitive edge against competitors. Major participants are investing heavily in R&D activities to improve repair procedures and reduce overall processing costs. Technological advancements including laser ablation mobile robot to reduce time and produce environment friendly products will positively influence industry growth from 2018 to 2024. OEMs focus on superior-grade products to meet the specifications and faster operations. Military aircrafts will witness over 3% CAGR owing to rising military aviation investments across the globe. For instance, in 2018, the U.S. increased its military spending by USD 80 billion, thereby enhancing product growth. Organic segment is leading the aerospace maintenance chemicals market size with around 69% revenue share in 2017. Operational efficiency along with cost effectiveness are major factors driving the industry growth. High preference towards product viscosity owing to labor friendly maintenance will further escalate the product penetration. Shifting manufacturers preference due to easy compatibility with various equipment offering superior performance & fast operations will drive the inorganic materials growth rate. Competitive product pricing coupled with better availability for customized orders will boost aerospace maintenance chemicals market size over the forecast timeframe. North America is predicted to surpass USD 2.6 billion by 2024 with increasing repair activities and competitive pricing along with presence of multiple industry players. The U.S. dominates industry share owing to vast expansion of aviation industry. Middle East aerospace maintenance chemicals market size will witness robust growth with increase in business and private aircrafts. Asia Pacific led by China, Japan, and India will register around 4% CAGR owing to presence of substantial number of MRO bases with better services and enhanced technologies. Constant investment from aircraft companies for MRO will further augment aerospace maintenance chemicals business across the region. Shell, Eastman, The Dow Chemical Company, and Arrow Solutions are among the prominent players in aerospace maintenance chemicals industry. Other notable players including 3M, Wesco aircraft, KLX Inc., and Henkel. Companies are implementing strategies such as strategic partnerships to enhance their industry share. For instance, in October 2017, Arrow Solutions announced strengthening its partnership with its Norway distributor to improve product availability.